Arsenal assistant manager Steve Bould accused the current crop of stars of letting themselves and the club down in a dressing room tirade on Saturday. The Arsenal stalwart was left seething by his side’s poor display as they slumped to an embarrassing 2-0 home defeat against Swansea. The loss leaves Arsenal in 10th place, 15 points behind leaders Manchester United with a third of the season gone. And according to sources, Bould ripped into the club’s under-performing players during a post mortem, claiming the performance was a let-down. The 50-year-old is also said to have blasted players for not taking responsibility against Michael Laudrup’s side. It is also understood Arsenal players were given the chance to air views in front of their team-mates. Certain players are believed to have complained that the club’s busy fixture list has left them leg weary in recent weeks. 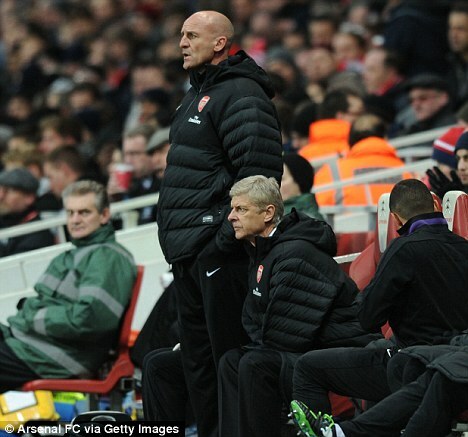 Bould was promoted to Arsene Wenger’s assistant in the summer after 11 years working in the Arsenal youth set-up. He won seven major honours, including three league titles, at Highbury and made 372 appearances. With the pressure building on Wenger, his right-hand man decided it was time for some home truths. The players who complained of tiredness are likely to get a rest in Europe this week. Theo Walcott, Jack Wilshere and Lukas Podolski will not fly to Greece on Monday afternoon for the Champions League tie against Olympiacos and Santi Cazorla and Mikel Arteta could also be rested.